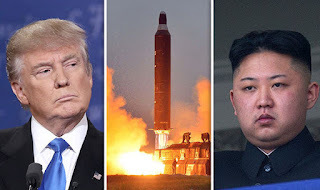 The President of the United States of America, Donald Trump, has hailed North Korean President, Kim Jong Un over his plans to stop nuclear bomb test in his country. North Korea will suspend nuclear and missile tests effective immediately and abolish a nuclear test site in the northern part of the country in a bid to pursue economic growth and peace on the Korean peninsula, its leader Kim Jong Un said. According to Korean Central News Agency (KCNA) , Kim Jong Un said his country no longer needs to conduct nuclear tests or intercontinental ballistic missile tests because it has completed weaponising nuclear arms, state media. It comes less than a week before Kim meets South Korean leader Moon Jae-in for a summit in the Demilitarized Zone that divides the peninsula, and ahead of a much-anticipated encounter with US President Donald Trump. “As the weaponisation of nuclear weapons has been verified, it is not necessary for us to conduct any more nuclear tests or test launches of mid- and long range missiles or ICBMs,” Kim told a ruling party meeting. “The northern nuclear test site has completed its mission,” he added at the gathering of the central committee of the Workers’ Party, according to the official KCNA news agency. Mr Trump heralded the development on Twitter as “very good news for North Korea and the World”. “Big progress! Look forward to our Summit,” he added. Pyongyang has made rapid technological progress in its weapons programmes under Kim, which has seen it subjected to increasingly strict sanctions by the UN Security Council, US, EU, South Korea and others. Last year it carried out its sixth nuclear test, by far its most powerful to date, and launched missiles capable of reaching mainland United States. Earlier this week, Donald Trump reiterated his administration’s dual approach of pursuing diplomacy and maintaining “maximum pressure” with biting sanctions. He also professed a willingness to abandon talks if they seemed to be leading nowhere.